I do not have any footage edited and ready for upload yet but I have plenty to say. 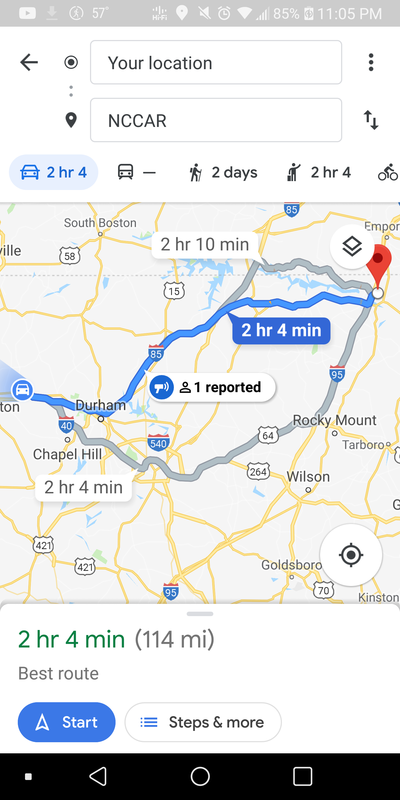 The 114 mile drive to NCCAR, where I took my '04 TSX last year, went extremely well. The Vig started up with excitement Saturday morning at 4:40am as I was loading the car up with tools, fluids, and cameras for the days event. Topped the tank off from a quarter below full with just under 5 gallons of 93 octane at Shell before I headed east on my two hour drive. Excited, worried and nervous and maybe even scared this would be my very first long road trip in the Vigor since I have owned it and not only would it be the longest trip but the most hard I have ever driven the car. On the track the car felt heavy and was really wanting to push a lot mid corner and steering turn in was pretty slow. For my 1st session I left it at the softest shock setting I drove the car on but for the rest of the sessions I tightened the front struts up 3 turns. This improved response but didn't help the under steer much. I never adjusted the rear in out of fear of it getting too much slide. It already had some movement mid corner with lift off and I didn't want to pus it much more yet. 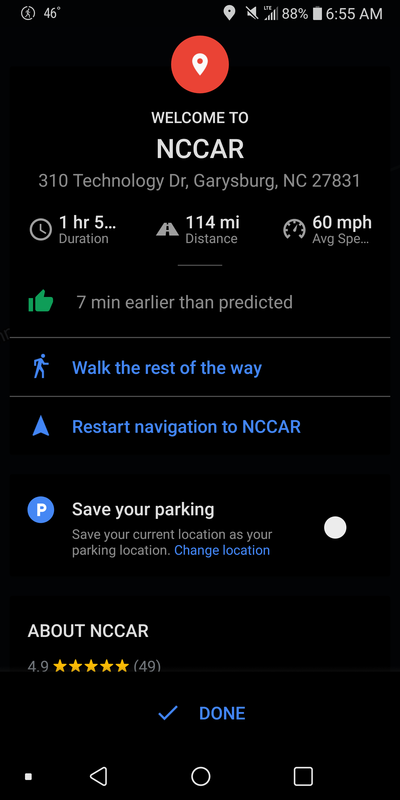 I really didn't know the car at the time. After my 3rd sessions I was moved up from Novice to Intermediate. I checked tire pressures while they were still a little warm and found them to be super low. 30.2 front and 32 rear almost evenly. Unfortunately I didn't have a way of pumping these up and too shy to ask neighboring drivers if they did I continued to drive the car as I know it for the day. 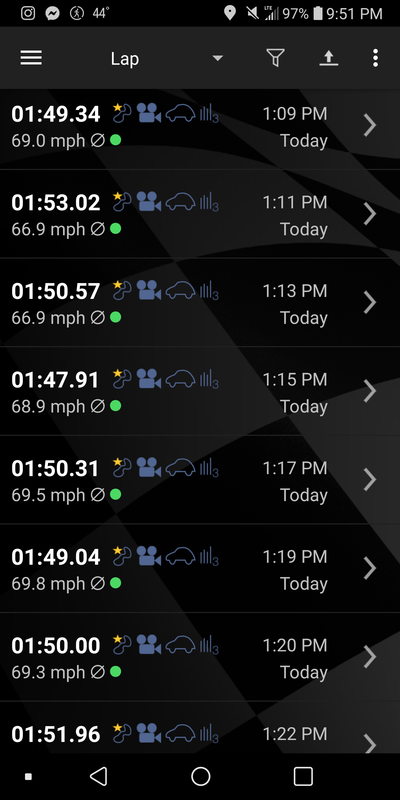 My fastest lap was 1:47.91 for the day. Could have been so much faster. 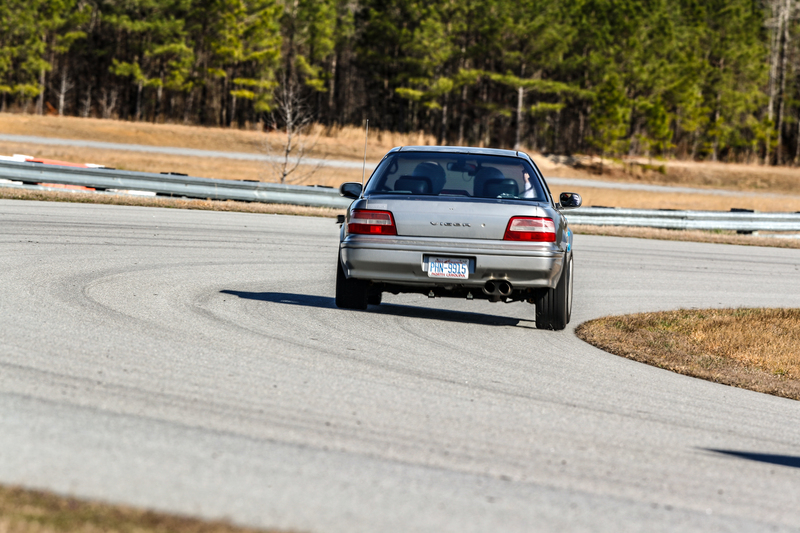 Looking at this photo, I guess you could say I learned my lesson with under inflated tires+ track driving. I'm confident that if these bad boys were pumped up to 35/37psi the car would had been so much better in every way. With all being said the car had no lasting issues. Checked fluids after every session, checked the ground for leaks and found that everything was staying perfectly topped off and where it needed to be and let the car idle for a few minutes and cool down between. I did run into two major problems between sessions though. 2.) The car overheated. I have the fan switch jumped to run the rad fans constantly since my switch doesn't work. I have a paper clip taped up with electrical tape that came loose due to some vibration and no longer closed the fan circuit. Didn't notice any issue on track but when I slowed down and stopped in the paddock with no airflow is when the gauge shot up. Instead of looking at my gauges in the pad. I was turning off my cameras. Off camera, the needle was pegged to the red hot H. I quickly had the connection secured and almost immediately the temp gauge dropped back to normal. I idled the engine with the fans and heat on blast for 10 minutes to be safe. The car afterward... stopped smoking and ran no different. I don't even know. Don't ask. But I was consistently hitting 110mph on the back straight after, had the same acceleration and smoothness as before and didn't have any ticks or knocks or new leaks. The car also brought me home with ease, returning about the same MPG as before even after 98 miles of pure track driving. 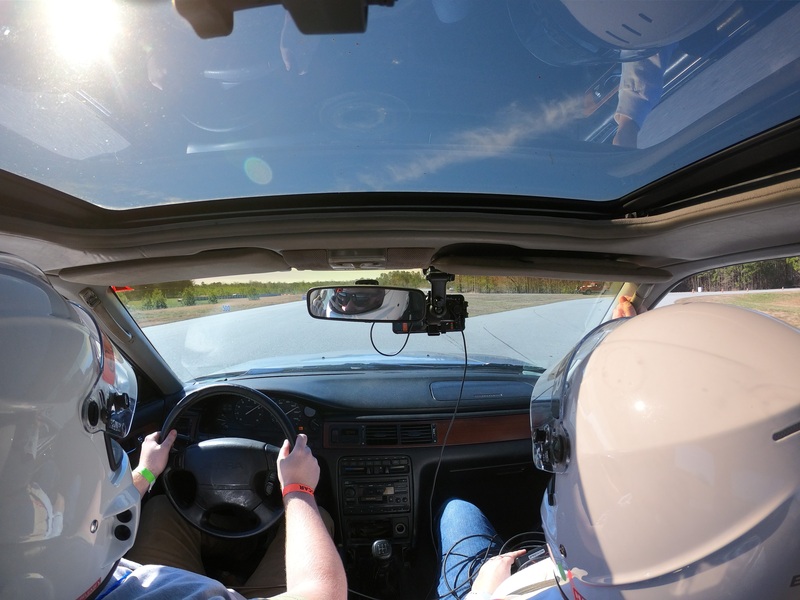 You'll notice I can't heeltoe downshift and my Apexing in this clip is very lazy and me and my instructor are chatty. But you'll also notice how good the car sounds! When I post more videos I will have a little better write up of how I feel about the car and what I want to do before my next event. Way to go Hondatalover! I love your commitment , dedication, perseverance and gumption in preparing/overcoming issues and then driving your car to the event, let alone having the faith to expect to drive it back under it's own power - all relatively trouble free. I'll second that. 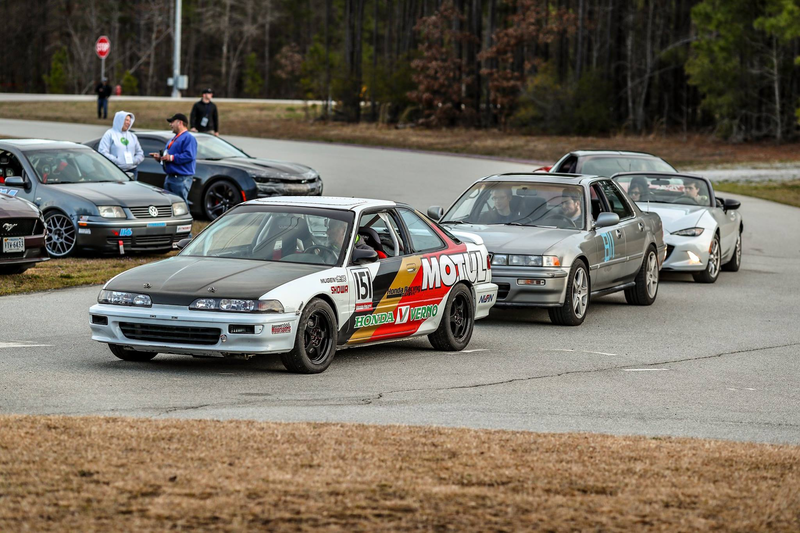 I noticed a very well used Civic sedan on a used lot over the weekend and thought "I wonder if that might make a nice track day car." I liked the part where the S2000 waved you on to pass him! It really has been the big break I worked so hard for with this car and it's definitely paid off in the best ways. Regarding tires, probably need a bit more camber. how much was the car understeering? Your track time in the Vigor took me back to 1975, when I was 19. There is a local bank that had their large parking lot set up as a weekend slalom course at the time. I seem to remember campaigning my car, but had some gearing issues. The car was a 1970 Chevy Vega with a 3 on the floor! Funnily enough the wife is starting her packing up for our big house move coming up in the next couple of months, and happened upon some long forgotten photo albums [remember them??]. In one box she found a photo of me beside the Integra at my very first race meeting in 1988. I don't remember looking that young! 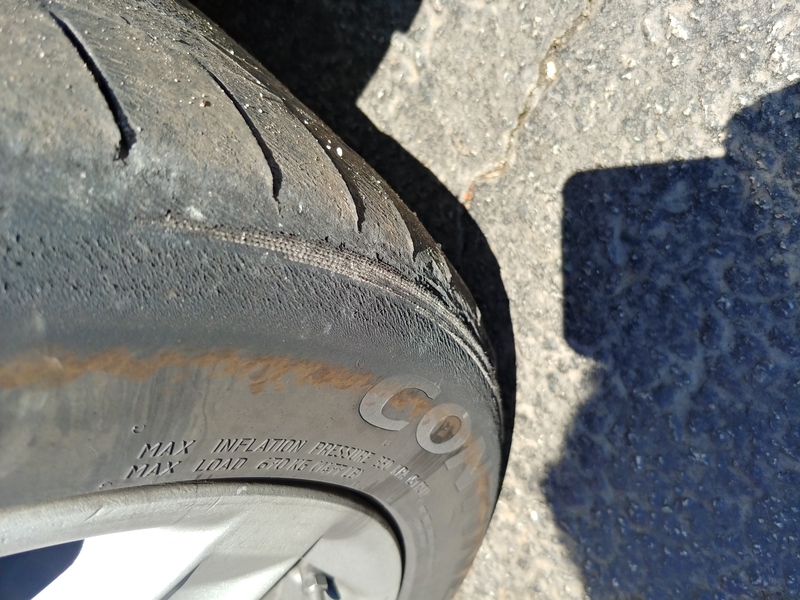 Looking at your tire wear and the cornering shots, I think you're going to need more than just increased tire pressure. 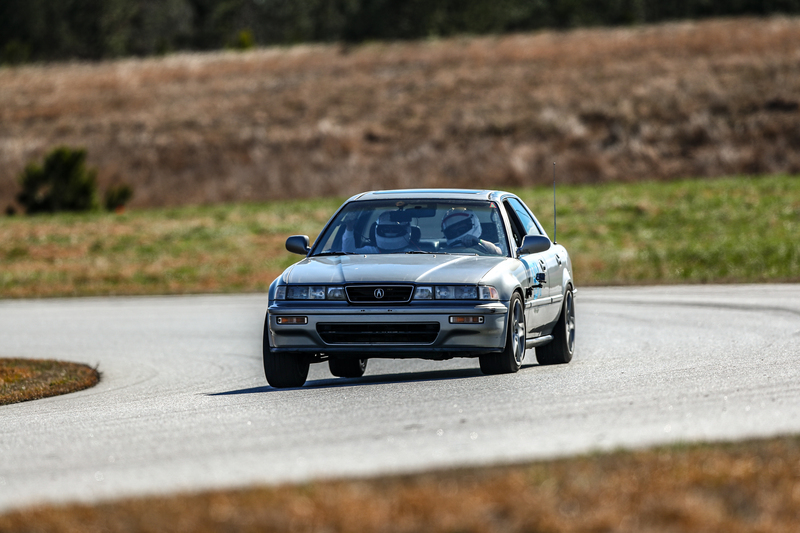 Those tires don't actually want too much pressure to run their best, but you need some camber. Add another degree negative up front and the tire wear and grip will get much better. That said, they're only going to go 1-2 laps before the heat drops your grip by quite a bit. This. Maybe diaing an eighth to a quarter inch toe out in the front / toe in the rear, before heading to the track. Invest in a portable air pump. What are your spring rates? Swaybar diameters? I see a lot of body roll. Reverse staggering your tires could help, as well. I saw the cornering shots and thought the body roll looked okay for a Vigor. It does look like HDL is hauling the mail there. I was thinking I'd dial the dampers up to 11 for the track. It might move some of the wear off of the sidewalls. Was curious about what my car made at the wheels so I put it on a dyno. 153whp @ 5,600rpm and 156wtq @ 3,800rpm. Graph was set to SAE correction and air altitude density was -181 with 39% humidity and 47 degrees Fahrenheit. 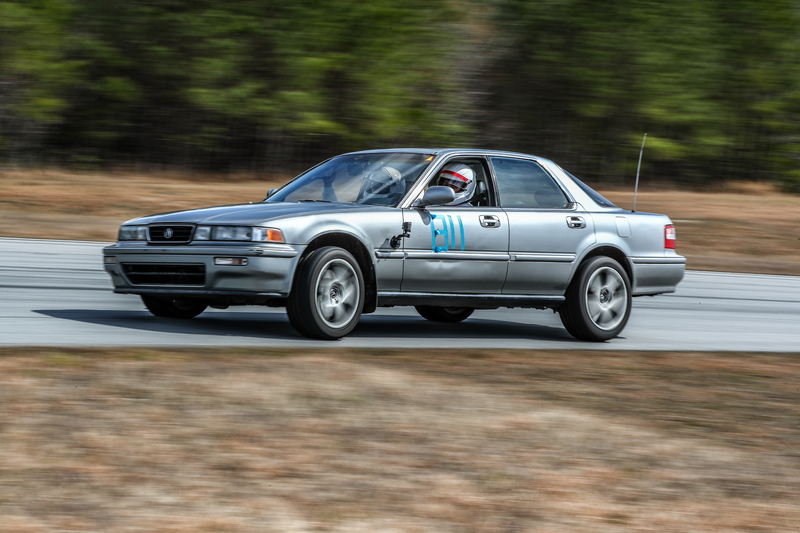 You will notice the car runs pretty lean up until 5,500rpm. We think Honda did this to make more power down low by being a little more lean and then to help cool combustion chambers and resist knock at high rpm they have it run richer which ultimately will to aid in engine longevity. Both runs looked the exact same. Another thing you'll notice is that from the factory it's rated 176HP at 6,500rpm and 170TQ at 3,900rpm. But on the graph it would indicate peak power and torque is a tad lower than spec'd. 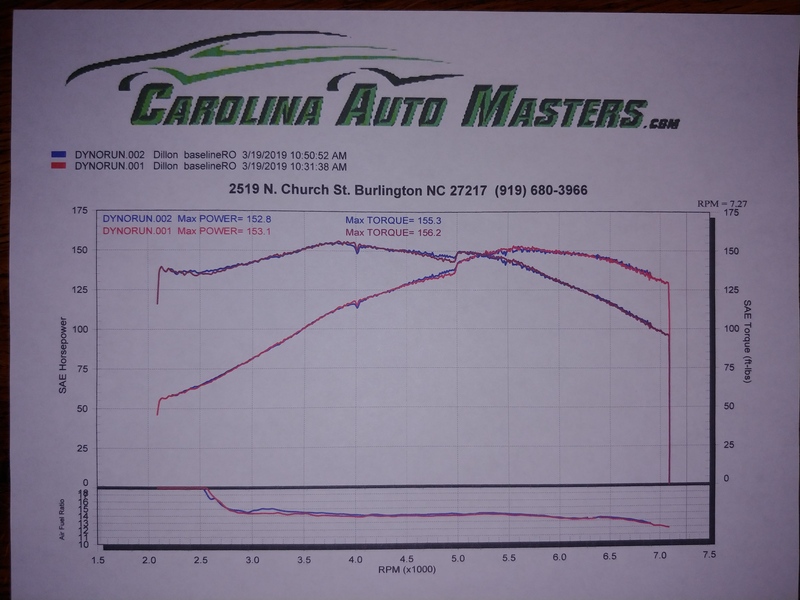 This could be due to my 2.25" vs factory 2" exhaust being too free flowing and not enough back pressure? I love the I5 engine sound. Thanks. Kinda hard to get YouTube's embedded code on mobile. Our video cameras back in the early 90s were bulky... even my Hi8. So I never took video of our 93 5MT Vigor. But I can tell you one thing, nobody, NOBODY ever beat us (car pool) off the freeway metering lights at the southbound 405 merge ramp at Wilshire Blvd. Those Bimmers and Benzes of the day were dumbfounded at my Vigor. Likely one of the very few MT'd cars that were sold in NA. The 4AT was so so, the 5MT did 0-60 in the very low 7s (quite fast for the time). Bravo... now, is the cassette working? Ah the Vigor. Thanks for sharing, looks like loads of fun and kudos to all the work you poured into the car. So this is the engine which sat in a field for several years. The car sounds great. Reminds me a little of one of the older old-school hot rods with a Ford 300 I6. Or a warmed up "Blue Flame" Chevy. Cool. New leather for the seats.